Al Aqsa’s gold Dome of the Rock can easily be found framed on the wall in nearly every Palestinian home and drawn among the colorful graffiti on the streets of Gaza. Obtaining an Israeli permit to visit Al Aqsa is difficult for young Palestinian men. For Palestinians living in the West Bank, only men over 55 and women over 45 can apply for military permits in order to enter Jerusalem and visit the holy mosque. Consequently many have been injured or shot dead while attempting to climb the separation wall from the West Bank in order to sneak into occupied East Jerusalem to reach the holy mosque. Al Aqsa is the third holiest site for Muslims after Mecca and Medina in Saudi Arabia. Although some Palestinians may live just a couple of kilometers away from Al Aqsa, many feel as if it’s as far away as Mecca considering the Israeli imposed movement restrictions that prevents them from visiting. For the Gaza Strip with a population of two million, 200 individuals aged 60 and above were allowed to visit Al Aqsa for a few hours each Friday. However Israeli authorities revoked permits for travel last December on the grounds that some worshippers failed to return to Gaza on time. “The permit that we get is only for one day which means we leave Gaza at 6 a.m. and need to be back at Erez by 6 p.m. so we only stay at Al Aqsa for less than two hours,” explained Futna Mashharawi, mother of six who visited Al Aqsa two years ago. “Every Muslim dreams of praying at Al Aqsa… the Prophet Muhammad said that a prayer in al Aqsa is equivalent to 500 prayers; it is blessed land,” said 21-year-old Kariman Mashharawi, who has yet to visit the mosque. The Erez border crossing reopened for travelers for the holy month of Ramadan, however the weekly quota decreased to 100 people. With 17,000 Palestinians on the list of individuals who applied for the travel permit, the chances of being chosen is a bit like winning the lottery. Since the end of Ramadan, permits were revoked once again. “The violation of the rights to freedom of movement and freedom of religion, and the threat of collective punishment if conditions are not met by individual worshippers, only emphasize the punitive and arbitrary nature of the permit regime, as well as the depth of Israel’s continuous control over the Gaza Strip,” stated Miriam Marmur, coordinator at Gisha- the Legal Center for Freedom of Movement in an email. Even seniors who have the required permits are rejected from entering at times. 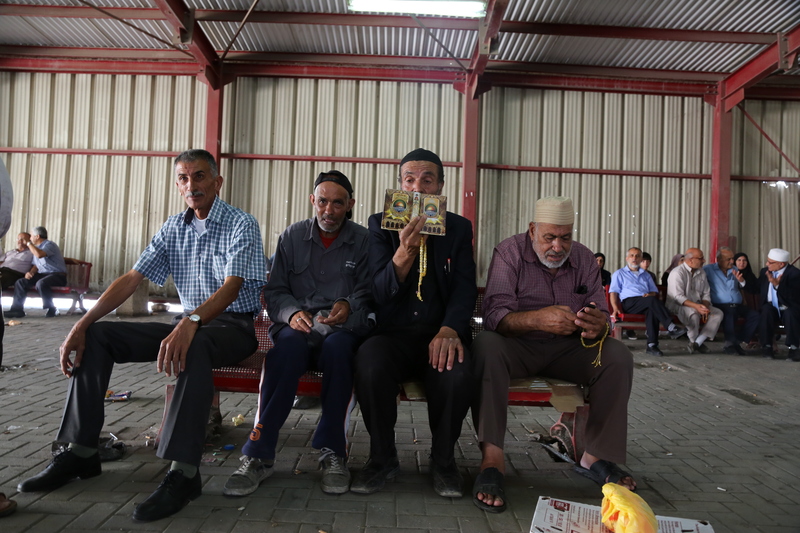 On July 28, 2017 Palestinians on their way to Al Aqsa for Friday prayer were turned away at Qalandiya military checkpoint since clashes took place in Jerusalem the day before. They reached their arms out through the bars and pleaded the Israeli officer to check their permits, but they were all turned away. Photos show the jubilant atmosphere at the Al Aqsa compound on the morning of Eid al-Adha on September 1, 2017 for the Palestinians fortunate enough to access the holy site.